The issue of salary is the one of the biggest unsolved mystery in the Indian startup eco-system. While salary reports of established, big MNCs are easily trackable, and researched via various platforms, there is no clear cut platform to gauge and test salaries given by startups. Although every ambitious techie wants to work with startups, experienced non-techies and marketers want to associate themselves with startups, but very few know how the financial metrics will work out, while working with startups. CutShort, who describe themselves as a “next-generation platform used by 60,000+ professionals to hire, find jobs, discuss and connect better” has come out with an interesting report, laser-focussed on the salary aspect of Indian startups employees, and companies which are paying the best and the worst. By gathering their responses, they were able to get insights from 50,000+ employees working across 11,000 companies, during a phase when the startup eco-system witnessed both the upswing and downswing of venture capital, job loss, and innovation. 4 Which Are Recruiters’ Most Preferred Startups? 5 Which Sectors Are Paying More? The report revealed that when it comes to tech talent, then Bengaluru is the de facto hub of India. 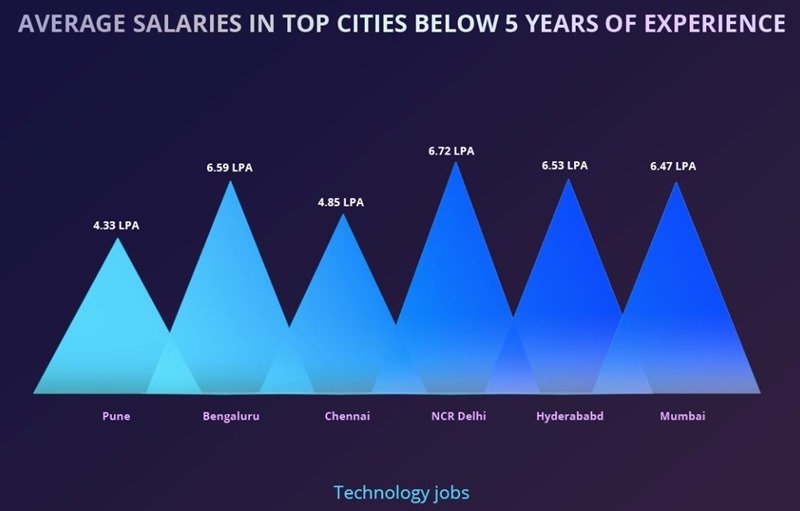 Techies in Bengaluru are right now getting the highest salaries, when compared to all other cities. When it comes to techies having experience of more than 5 years, then Rs 19.81 lakh per annum is the average salary of a techie working in Bengaluru. Hyderabad comes at #2 with average salary of Rs 17.56 lakh/year, and at #3 is Mumbai with Rs 15.99 Lakh per year. On the other hand, if a technical fresher is seeking out a job, then Delhi is the best bet. A typical techie with under 5 years of experience in Delhi will earn Rs 6.72 lakh per year, which is the highest in India. Bengaluru is at #2 with Rs 6.59 lakh salary, while Hyderabad is at #3 with Rs 6.53 lakh salary. Mumbai, the finance capital of India, has emerged as the #1 destination for non-tech jobs within a startup. For non-techies having under 5 years of experience, a startup in Mumbai will pay an average of Rs 6.83 lakh per year, which is the highest in India; followed by Rs 6.26 lakh in Bengaluru and Rs 6 lakh in Delhi. For non-tech professionals having more than 5 years of experience, Mumbai will offer Rs 15.88 lakh/year, which is second highest in India. 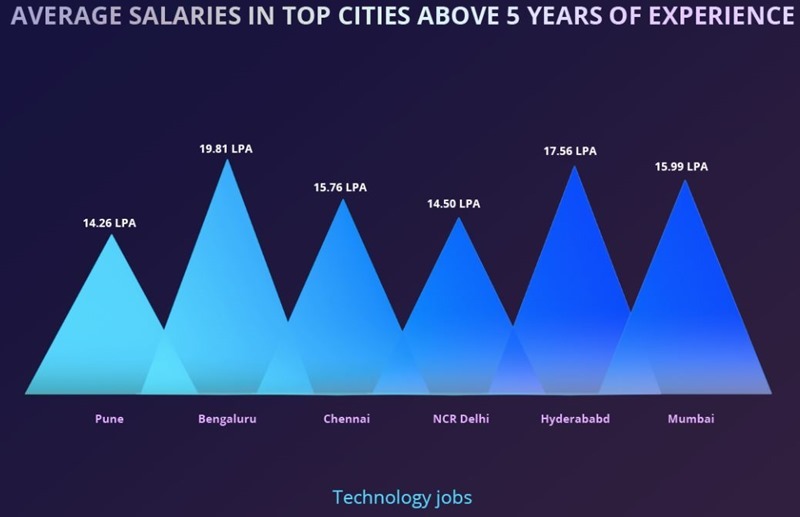 With Rs 16.67 lakh salary, Bengaluru will pay the most for non-tech roles, with 5+ years of experience. Which Are Recruiters’ Most Preferred Startups? 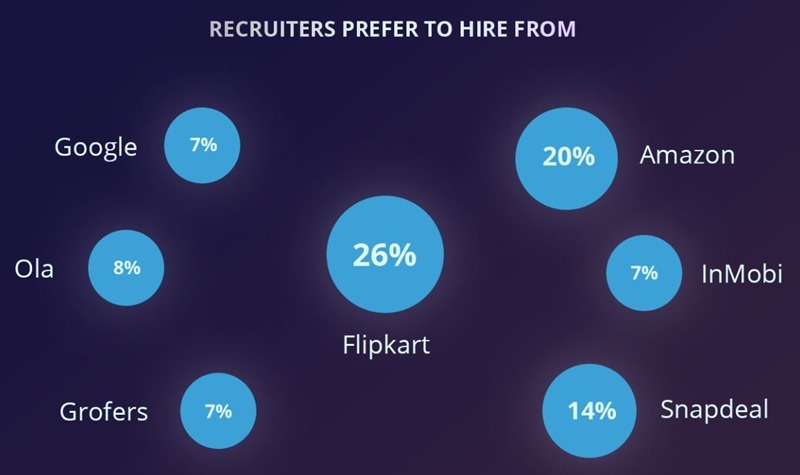 With 26% share, Flipkart has emerged as the most preferred company for recruiters to hire talent. This means Flipkart employees are always in high demand, among HR firms. 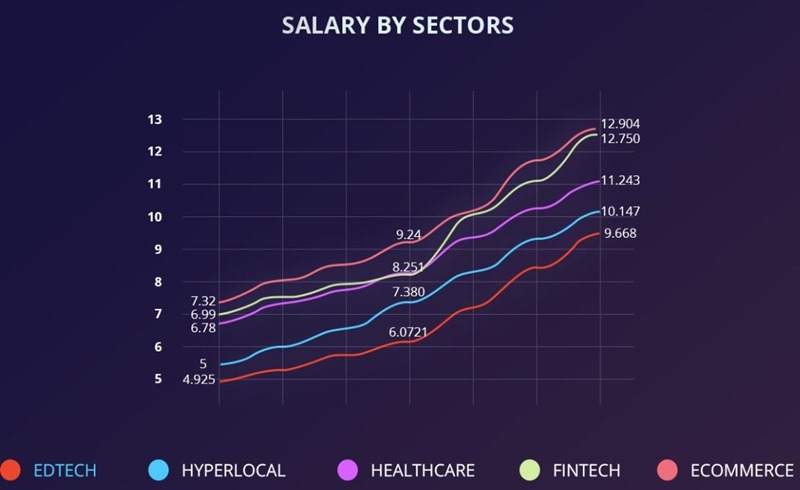 Which Sectors Are Paying More? This is one really beneficial question, which Cutshort aimed to answer here. As per the research, ecommerce is the sector which is right now paying the highest salaries. Maybe it is due to the cut-throat competition in the sector, and billions of dollars of VC funding? The report discovered that ecommerce firms are paying on an average 20% more salary, compared to other sectors. Fintech sector is at #2, while Edutech sector is at the bottom. Besides, the report also found that techies are paid, on an average, 20% more than non-techies, across all startups. Special mention of Pune and Chennai, as these two cities emerged as the cheapest talent locations across all cities in India. Hence, if a startup is bootstrapping, and hard on funding, then these two cities can be considered for recruiting high quality, yet cheap talent. For more insights and starts on Indian Startup salaries, you can view the complete report here. "Indian Startup Salary Report: Bengaluru Techies Are Best Paid; Pune & Chennai Cheapest For Talent Hiring", 5 out of 5 based on 7 ratings. Paytm Gold: Now, Buy & Sell Gold at Live Market Prices, Store At Paytm Lockers! …and what about people in the creative industries? How much do THEY get?